Burnaby, Canada, February 5, 2014 — Schneider Electric Solar Business, a global leader in PV inverters and in electrical solutions for the solar power conversion chain, is now shipping the new Conext Core XC-NA Series – a new line of central inverters designed for high reliability and compatibility with any photovoltaic panel type and installation. “We are very excited to announce that the Conext Core XC-NA is now shipping” said Laurent Bataille, Senior Vice President, for the Solar Business of Schneider Electric. “We have put this inverter through extensive safety, quality and reliability testing which includes dust, rain ingress, seismic and salt spray to ensure a very robust product. The Conext Core XC-NA Series is an outdoor UL1741 certified version of the very successful Conext Core XC central inverter which was launched to the market in 2011. The Conext Core XC is a leading series of inverters in geographies as diverse and demanding as India, Thailand, Europe and Japan. Conext Core XC-NA Central Inverter: Schneider Electric’s newest product, the Conext Core XC-NA, has been extensively tested for quality and reliability for increased uptime. This test unit is being exposed to dust and sand in the quality control testing chamber. The Conext Core XC-NA is available in 540, 630 and 680 kW power ratings and is listed to 1000 VDC. 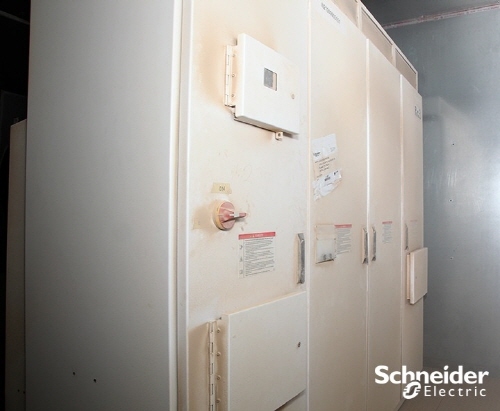 It comes with integral AC and DC switchgear which meets the requirements of NEC 690.17, an integrated DC combiner with a variety of fuse sizes, optional monitoring and it is Ontario FIT compliant. In order to ensure that the Conext Core XC-NA is ready to support future grid requirements, it is designed with highly configurable features like Reactive Power Control, Reactive Power at Night, Power Frequency Control, and Fault Ride-Through capability. It also integrates a smart PV ground fault detection scheme to reduce fire hazard risks in grounded PV installations. Suited for large commercial applications over 500 kW and PV power plant applications over 1 MW, the Conext Core XC-NA inverter seamlessly integrates with other Schneider Electric products to provide a comprehensive, bankable photovoltaic solution from a single provider. As a global specialist in energy management with operations in more than 100 countries, Schneider Electric offers integrated solutions across multiple market segments, including leadership positions in energy and infrastructure, industrial processes, building automation, and data centers/networks, as well as a broad presence in residential applications.